I would like to provide your more information about our Intercultural days 2019 at CUE. We have been running this event for 6 years now, always in January. We are trying to show our campus community including students, staff and faculty how beautifully multicultural Edmonton is. 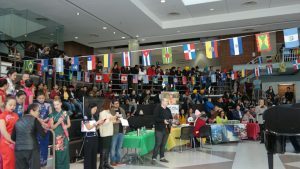 We also try to have community organizations that promotes cultures of many of our international students to be present, so that they can identify with the organization and showcase the place/culture they are from to their classmates. This year we had organizations representing the following countries participating: Poland, Germany, Ukraine, Czech, Iceland, Netherlands, Brazil, China as well as representatives from our Indigenous Knowledge and Research Center at CUE and Centre for Chinese Studies and Languages department at CUE. As all of our students have the lunch hour 12-1 pm free on Wednesdays, we plan the performances for that time. This year we used the full hour with contributions from our community partners: River Cree Singers performed indigenous drumming followed by CUE students performing a Metis dance. After that had Mikolaj Warszinski and Zuzana Simurdova played Franz Liszt and the Frederick Chopin and Maya Budzinski performed Henryk Wieniawski. We had jiu jitsu performance followed by Brazilian zouk dance. Our Indian students performed traditional Indian dance and song. Student from Ottewell Junior High performed beautiful Chinese dance with swords and umbrellas. And we finished with Dutch dance that involved all the students.